Climate change, the future of social security, the return of crop tops — life just keeps getting better and better for millennials, doesn't it? And now in even more GREAT news, it looks as though working women in their 20s and 30s are continuing to earn far less than their male counterparts. This is the dawning of the age of continued inequalityyyyyyy! Contrary to the results of a Pew Research Center survey that found that women ages 25-34 were actually making 93% of what men of their age range were earning (the national average is 77%), a new survey conducted by Wells Fargo found the numbers to be far less encouraging. After polling 1,600 millennials, the bank found that men ages 22-33 have a median household income of $77,000 whereas women only had a median household income of $56,000 — a mere 73% of what men were earning. Millennial women with college educations managed to close the gap ever so slightly by bringing in a median household income of $63,000, which is 76% of the income of millennial college educated men ($83,000). The wage gap is also indicative of how much harder it is for women to save money over time. 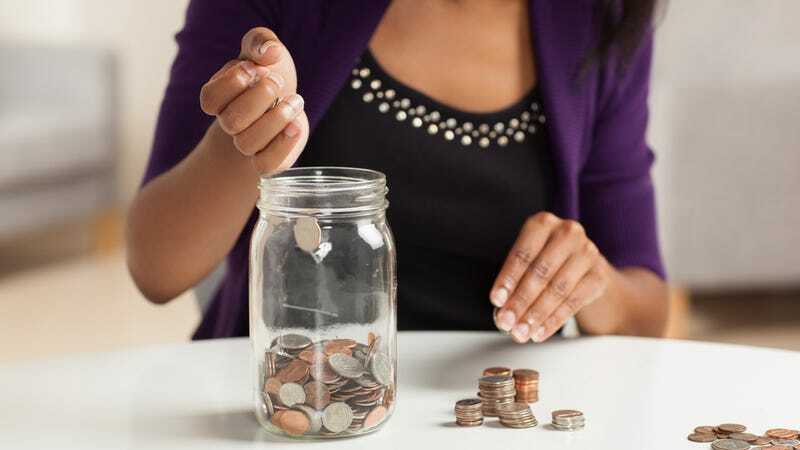 As Suzanne McGee writes at the Guardian, "No wonder only 41% of women reported feeling 'satisfied' with their savings (compared to 58% of the men): it's harder to even start saving when you start off with a heck of a lot less money." If the Wells Fargo data is accurate, and the wage gap is growing for millennial women, what's the takeaway? "Other than depression?" says [Karen Wimbish, director of retail retirement at the bank]. "It's a reminder that if this is the reality, that this isn't the cohort that is going to be narrowing the gap," younger women will have to save even more aggressively – and become even more workplace savvy – to compensate. Your college tuition bill and steep student loan payments will be the same as those of your male counterparts who are earning 10% or 20% more every month. Wells Fargo isn't going to give you a lower mortgage rate because you're a woman earning 75 cents or 78 cents for every dollar that a man earns. So it's not surprising that the Wells Fargo study showed that while 26% of men are saving 10% or more of their earnings, only 9% of women are doing the same.